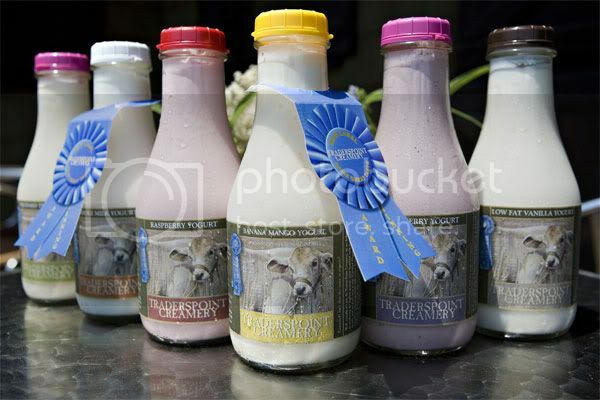 Have you ever tried Traderspoint Creamery Yogurt? I saw this yogurt at Whole Foods. I'm not even really interested in yogurt, but I am such a sucker for good quality foods, especially grass fed dairy and meat, that I found myself actually considering it and I don't even know what I'd eat it with or do with it. haha. Anyway this Traderspoint Creamery seems like a good company. They even have a restaurant with grass fed beef. Plus on their "about us" page, the upclose picture of their pasture looks like it came right out of the land of milk and honey. Anyone ever had this yogurt? huh? are you for real. powdered milk from a company that makes organic whole milk? let us know when the milk powder is out! Ha. Sorry for the delay on that! More support for you, TPC: your yogurt is in fact very delicious and unlike any other commercially available yogurt. But I like Jae don't eat yogurt anymore. How crazy am I that I checked five days later to see if you answered my question? Thanks. Louise and I are going to go to that TPC restaurant if we ever make it down to Indy/Bloomington. not really Jae, but some other comments on here seemed to. that's ok though. things pan out as they do. I hope you don't think I'm flaming. In fact, powdered milk or no, I really like the TPC yogurt and think it is one of the best that I have tasted in this country. (Sorry to be a snob, but French yogurt is definitely better.) I am also grateful to TPC for all the good things they do and wish them all the best with their business. If I lived in an area where there were no other options, TPC might be a viable source of dairy that I'd recommend. I just happen to live in an are where there are many other viable options, with (arguably) comparable quality and much better pricing. TPC has addressed the questions presented here, incl harsh comments. They're operating the best way they can muster, and setting their prices at exactly where they need to in order to keep the doors open. This is precisely the kind of company I support. I appreciate this. I respect this. We need more companies like this... many more, so that "someday grassfed operations will be the norm". We must let the cards play out. Right now, as things are, this is how they operate. Observe and do what you will accordingly. Personally I will not flame companies that are on board with what we're all about. As far as pricing - I understand that there are cheaper options out there, but I will not agree that you can find a better pasteurized milk or yogurt anywhere on the market in regard to taste, healthfulness, packaging conscience and farming practices. This is the true cost of this product, plain and simple - no corners are cut and only the best raw ingredients are sourced for all of the products. We are learning more and more that healthful food does not come easily and we have not been paying the TRUE COST for our food for a very long time. Jae - Thanks for the follow up. I think we need to be clear and separate the pasteurized and raw milk business. Those farms that you speak of do not have a successful, nationally recognized business to consider, so their possible liability is much less. Selling "pet food" is a tricky business and we are taking a risk by offering it as a side product (and not as a cow share - thats the loophole that we are not afforded). To cover that liability and insurance we must charge more. I already am discussing this much more than I should, so I really need to be careful, I hope you can understand. I have nothing against TPC and I hope you guys figure out ways to improve your products and processes. (I don't consume any kind of milk or yogurt any more.) But if I have a client who asks me about good sources of dairy, I can't in good conscience recommend you guys when there are cheaper (and equally good) sources around here. Now, obviously some people will buy your milk and yogurt and at your prices and they are happy with your product. And I'm happy that there are businesses like TPC do good things. But I know for a fact that there are small farms near Indy/Bloomington that are looking for more people to sign up for their cow shares and to buy their excess milk at farmers markets. I think their raw milk is better than your pasteurized milk. (Of course that's slightly unfair, but the vast majority of your customers are buying pasteurized milk, correct?) And their raw milk is cheaper than your pasteurized milk. Thank you for your answer. It frustrates me that you sell your raw milk for $20/gal (effectively) when I can get it locally (in Bloomington) for $13/gal from MUCH smaller operations that don't have the luxury of your economies of scale. What are they doing that you aren't? And yesterday I actually saw a quart of your **pasteurized** milk priced at something like $5.89/32oz = $23.56/gallon! I applaud the things you are doing right (glass bottles, for one), but it strikes me as ridiculous to set a price for pasteurized milk that is higher than raw milk. Paul: no, I haven't... but I have heard good things from local people about it. I'll probably check it out this summer. Jack: the thing is, you can get raw, grass-fed milk at my local farmers market for $13/gal, and I think less than that if you sign up for a weekly cow share. And as far as I know, TPC probably doesn't sell their raw milk outside of a small radius. btw... the gf raw milk here in socal is $8.49 for half gallon and I happily pay it, so TPC is barely more than that. I applaud your voice here TPC, and I'm glad to hear what you have to say about the milk powder. You did the right thing by posting this answer for all to see. Thank you. dangit melissa this really ruins the party. now i dunno about this... but that's why i ask so technically your answer is a good hack. thank you. I don't know. Powdered milk has always upset my stomach and it also has oxidized cholesterol. It's a common practice though and sometimes not labeled. Ever since I started avoiding ALL commercial yogurt, I've felt much better. I would at least assume that the powder is made from their own grass-fed milk, though. I can't remember exactly at the moment but I know that when I looked at the ingredients everything seemed totally fine. Label wins again. It makes me sick how they try to advertise their product as the most natural healthiest thing alive (we even got a cow on it !) and then use nonfat milkpowder. Pussies. Jae, have you been to the restaurant that the creamery has? http://www.tpforganics.com/the-loft-restaurant/ Any good? I really wanted Melissa to be wrong, but she's right again: http://www.freeimagehosting.net/image.php?c660dde4f6.jpg Just took the photo with my phone. i just checked their website. i like that they don't use cans. where did you get it? i don't have a whole foods close by so i rely on a mom n pop shop for my organic food... maybe they can order it in for me. Yes Jack, I was asking about the label. What are the ingredients ? i don't understand Ikco. are you asking if they make all the right claims directly on the label of the yogurt? if so, they do. 100% grass-fed organic non homogenized, not ultra pasteurized whole milk yogurt. great idea heather! btw... it's $7 here in san diego too. Label ? Words are cheap. Just picked up Let's Do Organic coconut cream -- haven't tried it yet (so can't speak to how good it is), but the only ingredient is organic coconut. yah i was wondering about that tony. good point. i think i'd stick with the plain variety. you play with dairy? cool. It's definitely drinkable. I never tried straining it, which produces a thicker, Greek-style yogurt. Maybe I'll give it a shot if I decide to play with dairy again. yah they have this on their site: "We do not use any stabilizers in our yogurts, so our yogurt is of a thinner consistency... Because we do not use any stabilizers, you may notice that we have some separation in our bottles from time to time." This goes back to the other post I just made about companies giving us the pure stuff. I'll take qualified thin over disqualified thicker. But hey, is it think enough to drink straight like cream? hehe. I'm serious. I don't eat yogurt so I really don't know. We are 100% grassfed - no grain at all. Ever. We are the only nationally distributed 100% grassfed organic dairy, and while our prices may seem high, once you come to understand how hard it is to produce 100% grassfed milk of any volume the price makes sense. There is a reason 99.9% of the farms out there feed grain - it produces tons more milk. More milk per cow equals more money. When our cows produce about 1/2 the milk of a "normal" cow, that obviously affects pricing. Jae - the raw milk (for pet consumption, of course) is priced that high mainly because of liability concerns - I think you can piece that together, if you know what I mean. We are not proud of our prices, and trust me, we are not making a ton of money - but we are charging our consumers the TRUE cost of our products - we truly wish that everyone had access to and could afford products like ours, but can only dream of that day at this point. About the milk powder - we do use 100% grassfed milk powder and are in the process of phasing it out. Our owners are supporters of Weston A. Price and want to milk powder out just as bad as everyone else - it is just something that is much easier said than done. Regardless of how it appears on the label (milk powder, non-fat milk, etc) I don't think you will find a medium to large sized company out there not using milk powder in their yogurt. We have decided to be up front about what we are using instead of hiding behind the typical "non-fat milk" line that most companies feed. We hope to have it completely out of all yogurts in 6 months, and currently are down to the bare minimum to keep the product consistent for the "average" consumer. I'm obviously biased here, but I came across this in the forum and couldn't let it pass by without letting everyone hear "our" side of the story. I can honestly say that we are doing things the right way, and I am so proud of the products we make - grassfed, minimally pasteurized, glass bottles, sustainable farming, family owned - they are all important words that we live by every day and never compromise. Please feel free to ask me follow up questions - I would be happy to discuss them. Be well. I purchased a bottle of TPC's plain yogurt from Whole Foods the other day, and it is delicious. I checked their website and they claim to use Brown Swiss cows, which typically produce A2-dominant casein: another plus. However, I am disappointed that they use milk powder. As Melissa says, milk powder contains oxidized cholesterol, which is one source of dietary cholesterol people really should watch out for. Hoping that TPC makes the switch soon. I buy it all the time. I buy the plain, whole milk variety. I use it to make smoothies for breakfast. I add frozen berries and an egg. It makes great smoothies. It is thinner than typical yogurt which makes it good for smoothies. The plain stuff tastes great, but it runs for $7 here in north Boston. Which is why I splurged $50 on a Williams-Sonoma yogurt maker. I can get the same result in that with a $4 quart of grass-fed milk. Or slightly inferior quality from regular milk, which is what I normally do. The yogurt maker also lets you play around with the consistency by playing with the starting heat and the total time, and whether you use old yogurt or powdered cultures. Are you located in or near Indiana? TPC is near where I live. I find their products quite decent but very, very overpriced. They sell raw milk for $5/quart = $20/gallon. Ridiculous. I like that they are in glass bottles, but I don't like that they are pasteurized. Better values and products to be found at local farmers markets IMO. I know this is an old question, but I thought I'd chime in with my support of Traders Point Creamery. I was surprised to see this question here - I didn't realize that their products are in stores around the country. I buy from their farm store. I don't buy their yogurt, but I get my pastured eggs, grass-fed beef, and many other paleo goodies such as grass-fed organ meats and bones for broth from their farm store. I also frequently buy their whole milk in order to make my own yogurt. I haven't researched their practices extensively, but I get a great vibe from their products and workers every time I visit their store. I thought you might want to hear from someone who has actually been to the farm and talked to the workers many times. I think their intentions are great, and I love the products I buy from them. Oh my God, this is stuff is so amazingly good - plus the benefits of grass-fed vs. grain-fed cows are impressive. I used to nosh on Seven Stars Plain yogurt (which is delicious) but I like the grass-fed guarantee of Traderspoint. Very yummy and quite addictive. At those prices I'm def making my own. I've been experimenting with making yogurt from higher fat dairy. First whole milk and cream and then half and half plus cream. I think I've got it right. 2 quarts of half and half and 1 pint of heavy cream. That plus one vanilla bean, no sugar. I get a thick body and a lovely cream top. The vanilla bean softens the slightly tart taste. This is so easy. I use straus dairy which is grass-fed part of the year and silage/grain fed part of the year. I just heat the half and half and cream mix (hold 5 minutes at 165 degrees) and scrape the vanilla bean into it. Let the pot cool and when it gets to 115 degrees add the yogurt culture. Put it in jars and let it ferment for 24 hours in the gas oven either barely on (115 degrees) or just the pilot light. (don't open and let heat out) I just don't understand why powdered milk is necessary. I don't use it and don't need it. Also for a no casein style make homemade sour cream from 100% heavy cream. Here is a good link to recipes. My kids loved that. It look too healthy not to eat. LOL. Tasty stuff, though the flavored varieties are sugared to the hilt. i'm not a huge yogurt eater either, but this looks good. it's hard to find good companies that use no stabilizers. i've been trying to find some good coconut cream without guar gum, but no luck yet. I have. It was good, but a little thin for my tastes.